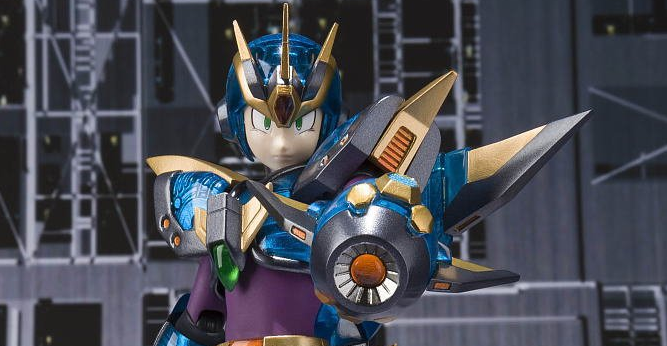 *SIGH*... A D-Arts Rockman figure and I don't want it. I hope not too many people share my feelings about this. I'd hate to see this figure's poor sales put an end to the entire Rockman line the way that accursed April O'Neil figure tanked the awesome NECA TMNT figure line. @Prof: I doubt this would tank the series. It would just be a sign that they can't do too many figures of the same character, meaning potential Zero, Axl, and X armour figures would be canned. Also you forget, even if this goes bad, that Sigma statue will more than likely make up for everything. It looks great, but they really should expand characters. Bosses would be nice. Prof. Megaman: Are you crazy? Iris or or some of the other boring random obscure characters, would most likely tank the line way more so than UA-X. Speak for yourself about that not wanting it stuff. Honestly I'd still like to see a Megaman Volnutt figure made. If any characters deserves a figure it's him. There are a lot of figures of Mega Man himself, I think they do need to do other characters but like you guys say, if they go too obscure it could mean low sales or limited releases... If they stick to main-ish characters they'll still sell, Vile did ok & we've got Bass/Treble coming soon.. i'd personally like to see Protoman but I guess he's just a matter of time also kinda hoping they include Beat with him + a Break Man alternate face. Some bosses would work as well, I voted for a Wily figure in the last poll but someone like Storm Eagle, Harpuia or Snake Man would be cool too.. Either way i'm excited for Ultimate Armor X & hope Bandai continue the line going forward! @anonymous Considering Iris has NEVER had a figure of any sort, I can't see it tanking. Even Alia Layer and Pallette have had mini-figures, and Colonel had a tiny-headed toy years ago. "Considering Iris has NEVER had a figure of any sort,"
That's not entirely accurate; There's a model/garage kit of Iris but in Colonel-esque hybrid armor. They pop up on the Yahoo Japan Auctions every now & then. @Prof Megaman: Like I said before, if Ultimate Armour x tanks, it will reduce the chance of alternate designs for characters being released. Jet/Power megaman would not happen because a Megaman figure already exists. Sigma deserves the statue he is getting. He was in all 8 X games. And Protoman will come. He's inevitable. @4:15 PM: Sigma deserving a statue because he was in all 8 games is a massive understatement. Nevermind the fact that he is the main antagonist of the entire X series, or that he has a large amount of back story and is a huge assistance to the character building of all the main characters, or that he has the second most amount of redesigns in the X series, BUT HE'S SIGMA, LOOK AT HIS D-ARTS FIGURE, HE IS S-S-S-SICK! Don't dare sit there and tell me he won't sell. If he doesn't sale and a character like Iris does, than this world is utter trash. Blues/Proto is cool and is a given I agree. No need to stress about that. Honestly, I say the Sigma statue might tank the line because we all wanted a articulated figure and a simple statue. Its like, lets see, its a Ultimate Armor X, you can pose him, effect parts, and interchange parts. The Sigma statue............. just a statue. If anything its the statue that might tank the link. And they've given a legitimate reason for the statue. Sigma is too big and bulky for the articulation to work out, so he has to go statue.